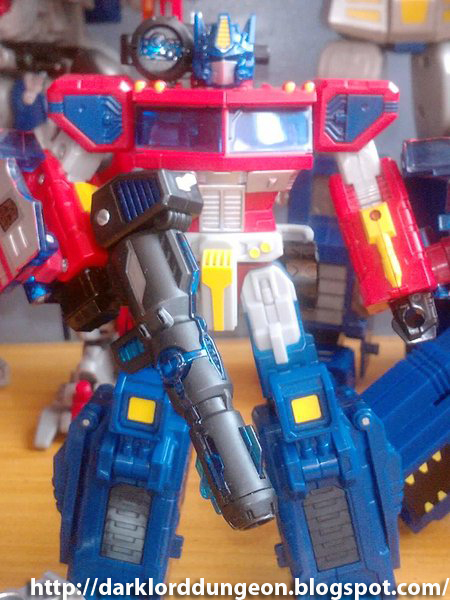 The funny part about this particular upgrade for the Classic/Henkei Optimus Prime is that there is very little in terms of reference to "The Another War" or to "Perfect Effect", on the internet. Google it, and most likely you'll end up with stores or blogs are are previewing the TAW-01, but nothing about where or why it was used or about who made it - though from the looks of it, Perfect Effect has been around for quite some time and has a lot of killer upgrades that - like the TAW-01 - are seemingly outside of the Transformers continuity. Perhaps this is how Perfect Effect wants it. Unlike Fansproject which maintains a website and works to upgrade or add on to existing Hasbro Transformers to bring them closer to their cartoon/movie/comic book versions, Perfect Effect seems to dabble in "what ifs" and other universes, touching only ever so slightly in the main continuity and taking things to the extreme. Or they're just avoiding the inevitable copyright lawsuit. And the TAW-01 is a perfect example of this. In June of 2011, Green Lantern will hit the big-screen. 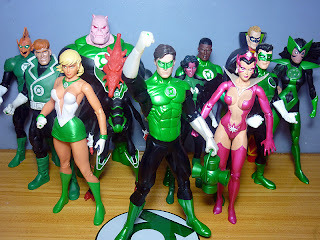 So I thought I'd take the opportunity to showcase my Green Lantern collection. I actually have more Hal Jordans that what's displayed here, but most of them are already in storage. Most of these are from the Green Lantern Blackest Night Series (Ivan Reis art). Others are from the Green Lantern Series (Ethan Van Sciver art) released a few years back; and the remainder are from the DC Universe Classics line and there's one from the Justice Society of America line (Alex Ross art) released in 2010. While trawling through a G.I. 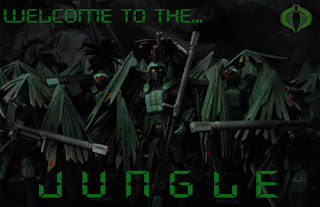 Joe forum, I came across this image which totally reminded me of my Jungle Viper Review. I just had to share it. It totally adds to the Cobra Jungle Viper mythos don't you think? 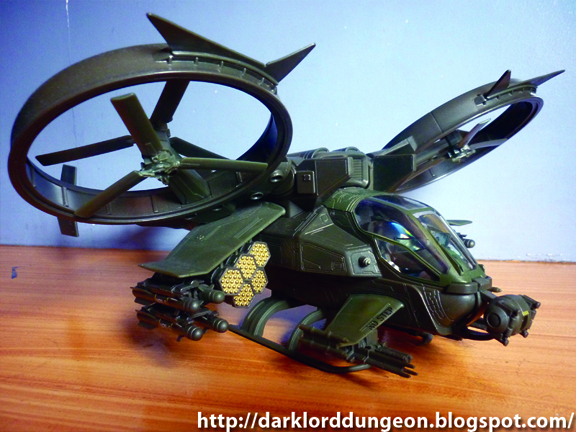 Presenting the Cobra Jungle Viper! Released late this 2010 as part of Wave 2 of the G.I. Joe POC series, the Jungle Viper retails in the Philippine Black Market - as it has yet to be released in the malls - depending upon who you ask - between PhP 650 to PhP 1,200. The collector card on the back reads: "Jungle-Vipers are Cobra troopers with special training as silent marksmen. Their opti-camo ghillie suits have digitized camouflage blades, which makes them disappear from any detection devices. They also use multi-visual image systems that give them wide visual displays of surrounding territory." So he's not the bird-man that he initially appears to look like. Those "wings" are all part of his special ghillie suit (To the uninitiated, a ghillie suit is a parka like netting worn by snipers that covers them from head to toe. Snipers attach local foliage to the suit to blend in with their surroundings. The result is the ability to move into position and stay hidden when required). 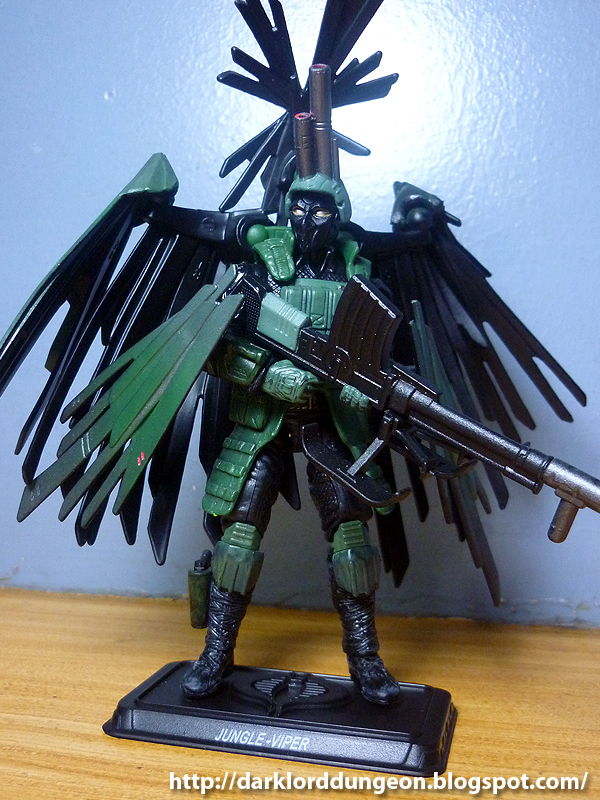 When I first saw the model, I thought that he was an updated version of Raptor - the Cobra genius accountant who could... well... talk to birds so he dressed up as a bird. Apparently he's not. He's a jungle sniper. The most common criticism that I've encountered regarding the Scorpion Gunship was that a lot of people didn't see it in the movie. It's also not in the crappy video game that was released following the movie. The reason for this is that more often than not, the Scorpion Gunship is overshadowed by the more familiar troop-carrying Aerospatiale SA-2 Samson. But watch the film again and you will be able to make the distinction between the Scorpions (Look to the left) and the Samsons (it's the big fat one that looks like a Huey on steroids) - although the Samson has yet to be released as a toy. I'm here to talk about the Gears of War Pack number 2 (Not to be confused with Fenix and his video game of the same title.) 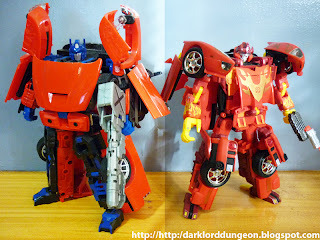 or TFC-005 - retails today for around PhP 1,750 to PhP 2,500 depending upon whom you ask. "Unyielding resolve has no conqueror"
Presenting Omega Supreme from the Transformers Energon series. A friend noticed him standing at the back from a previous entry and asked who he was, so here he is. That's his motto above which is easy to say when you're so big. This baby stands nearly a foot and a half tall (16 inches) and weighs in at 4.5 lbs making him easily one of the largest transformers I've ever owned. Like the G1 Omega Supreme, the Energon Omega Supreme has the signature visored head - although this one has two horns instead of one. 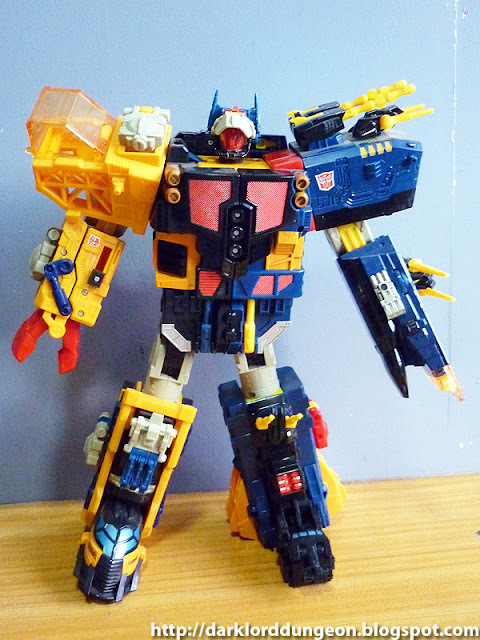 This Omega Supreme also loses the tri-claw left hand in favor of a two claw hand; and trades in the right hand cannon in favor of something that looks like it came out of a Macross movie. Of course the biggest difference between the G1 Omega Supreme and the Energon Omega Supreme is the color. Half of this Omega is bright yellow, and the other half is Blue - which is a big clue that screams at you that this Omega splits in half. Like the original G1 Omega, it's fully articulated and has a few hidden electronics and surprises to boot. Check out the Metro Toys Warehouse Sale from Nov. 15 to Dec. 30, 2010 and get as much as 70% off on toys. 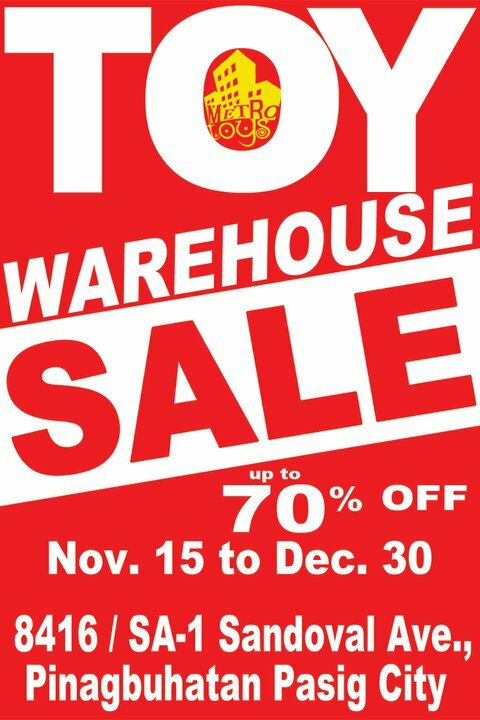 The Metro Toys Warehouse Sale is located at 8416/SA-1 Sandoval Ave. Pinagbuhatan, Pasig City. Presenting Transformers: Alternators Optimus Prime and Rodimus. These are Alternators (Hasbro, Made in the USofA), not Binaltechs (Takara , made in the land of the rising sun). There is no official story line for the Alternators, but there is one for Binaltech which is released in small comics included with the toy. Personally I believe that the line was created in order to promote the car-lines of Subaru, Ford, Mazda and Chrysler. If I'm right, there were at least three lines that entered the market in 2003, a plastic line (Alternators), a die-cast line (Which was more expensive, Binaltechs) and a knock-off line which was incredibly cheap and very hard to distinguish from the plastic line. These two are from the plastic line and nowadays retail for around PhP 2,000 to PhP 2,500 MIB; twice that if they're the die-cast version and maybe PhP1,000 less if they're loose. 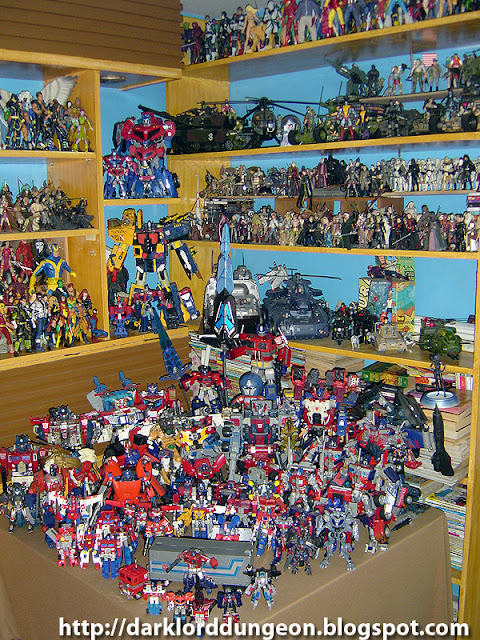 All my Optimus Primes. 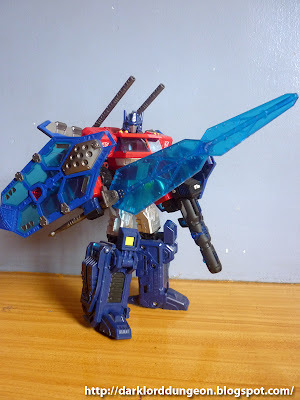 There is only one person whom I personally know who has more Primes than I do - although we debate this as he counts ref-magnets and other Knick-Knacks and I count the Optimus Primals. I'm particularly proud of the Primes that can combine with other Transformers or which evolve with their paraphernalia. The heroes - only the heroes - of my Marvel Legends collection - I'm not a real fan of the smaller Marvel Universe series because I remember what Marvel Legends cost a few years ago, and it just makes me sad if that's all I can buy today for the same price. ToyBox Waltermart in San Fernando, Pampanga is now open. It's located at the second floor of Robinsons Department Store.